Before I start raving about how wonderful Restaurant Jag was, let me just apologise in advance for my atrocious pictures. Firstly, it was my birthday dinner. So you can imagine, taking pictures and being overly fastidious about it was certainly not my priority. Secondly, the dim lighting that makes Restaurant Jag oh-so-cosy also made my photos oh-so-crappy. So now that I’ve got that out of the way, on to the rave proper. 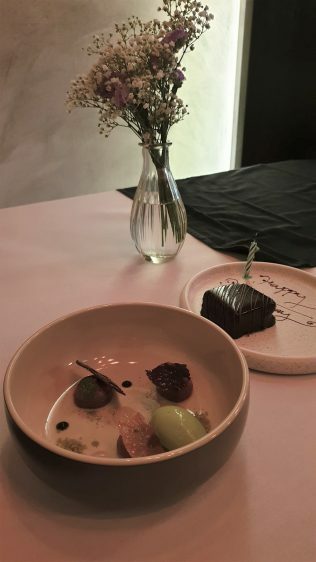 Now, if you’ve checked out my post on Preludio, you would have read that this year, for my birthday, I wanted to check out fledgling restaurants instead of going down the accolade-filled route. Like what I did with Odette last year. 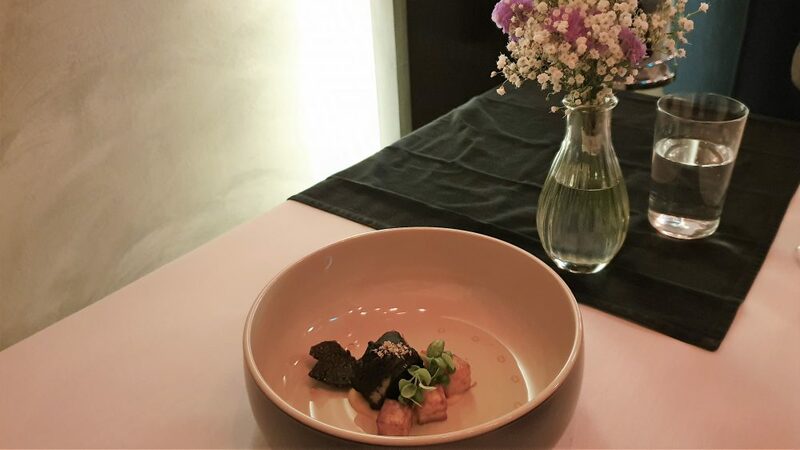 Jag opened in November 2018, and at first, I was hesitant about the whole showcasing indigenous herbs from the Savoie region concept. I mean, they are just herbs right? Would I be eating just sprouts and shoots, I wondered. But fast forward a few months later, and a few reviews read thereafter, I decided that Jag would be the place for this year’s birthday dinner. The ambience looked wonderfully cosy, and the fact that there are only 7 tables made it feel all the more exclusive, and I wanted a romantic dinner like that. Just a side note, I knew I was halfway to making the right decision by my interaction with the staff when I called about my reservation. I realise now that it was the restaurant partner, Anant with whom I had spoken, but regardless, the person on the other line exuded warmth and sincerity both times when I called. Upon arrival, I am greeted by name and shown to a cosy corner of the restaurant. 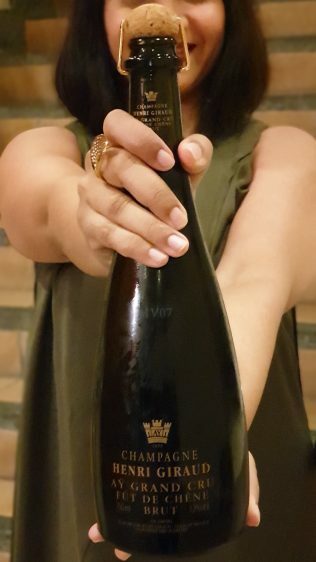 I handed over my beautiful birthday tipple and I must say right now that I was so happy that they took such great care to chill my Henri Giraud Fut de Chene to perfection before pouring it for us. Yes, that meant a slight wait, we should have iced it a long time before leaving the house, but it was worth the wait. And not just because the champagne in itself was remarkable but also because, and this is my favourite part of the dinner, they curated the degustation based on the bottle that I had brought. 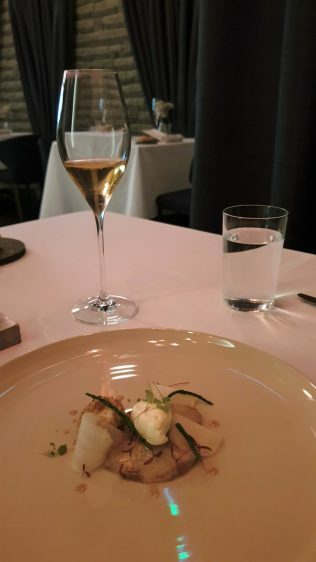 Well, I’m sure they already had a pre-set repertoire of dishes for the night, but what I mean is, they created the 7-course to pair perfectly with the bubbly. This is special because there really is no fixed menu, and this is true commitment to creating something for your individual diner’s palate and mood. Every dish in the 7-course Expressions ($168) menu highlighted a herb, and I’ll be damned if I can recall the taste of them all and the value they added, but here’s the rundown of the dishes. We had a couple of canapes: A potato puff thingy and a nettle, cauliflower and seaweed gel. Then an amuse bouche with coriander and pumpkin. First dish – artichoke that is served two ways; braised and raw. 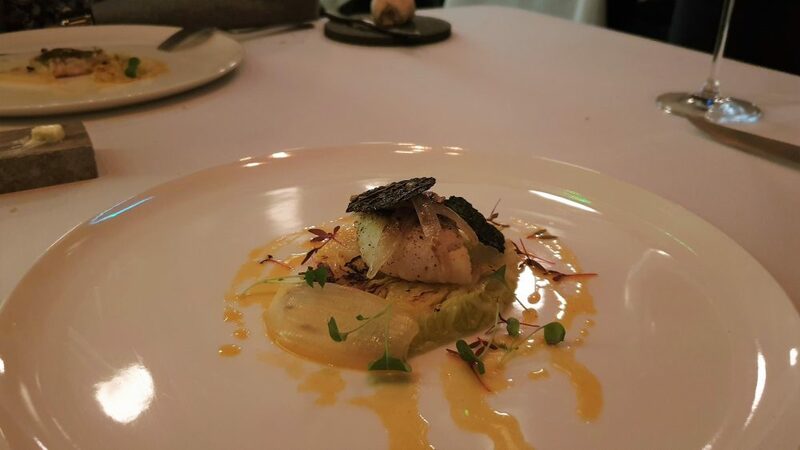 With a quail’s egg that had been cooked and coated with heliantis (part of the artichoke family). The cream which had reine de pres (meadowsweet) and the micro mustard leaves added spicy notes to the dish. 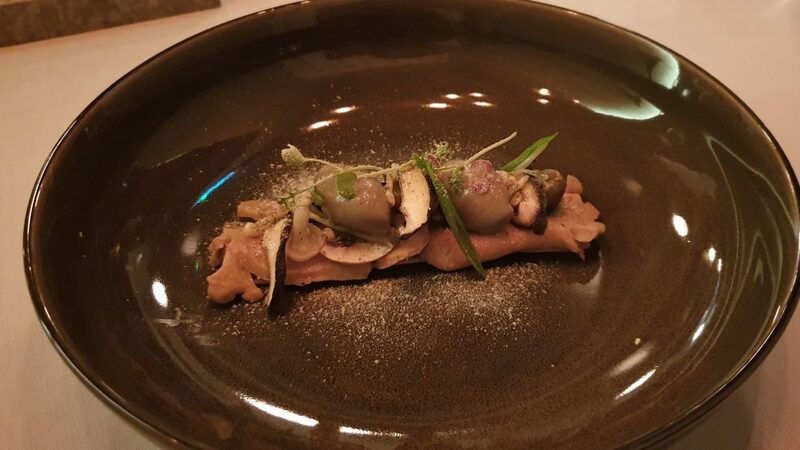 The second course highlighted mushrooms – button, shimeji, shiitake – and the bouleau (birch) herb. 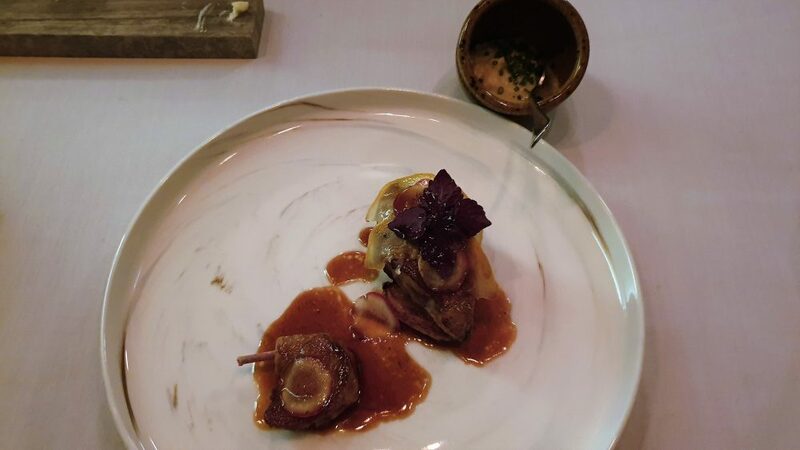 Served with a sourdough crisp and grilled foie gras made the dish moreish, while pickled shimeji and button mushroom ice cream added a refreshing twist. Next herb to take the stage was angelica – finally, a herb I had previously heard of. 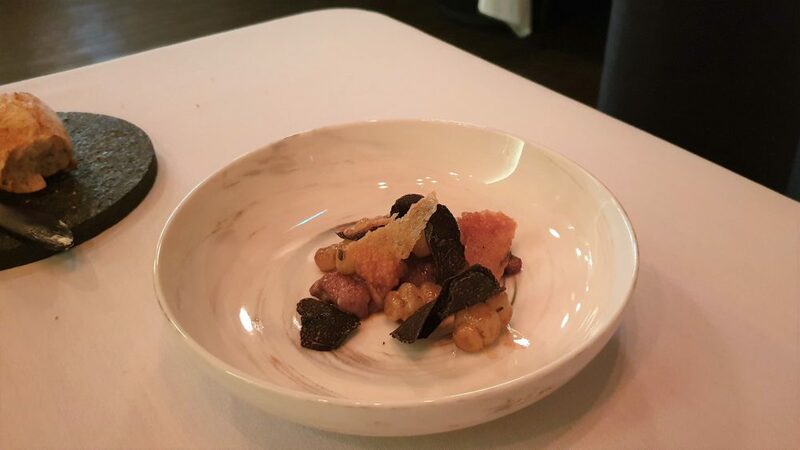 The dish that it dressed though featured… veal sweetbreads! Now, you might know by now that I am no fan of offal, but of course, I am willing to be adventurous, so I tried it. It helped that Jag used another interesting ingredient that I had not tasted before – Crones (Chinese artichoke). Looking rather dodgy like larvae, the vegetable nevertheless added a crunchy distraction from the gland I was attempting to eat. I think that the rather earthy and pungent flavours of the angelica and the black perigord truffle helped to mask any other scary scents that might have been present, most likely just in my head. The fourth dish showcased achillea (yarrow) by way of a gel. The slightly bitter taste was a contrast to the sweetness of the scallop that was encased in an umami-rich squid ink tempura. Another fish dish was next, this time a John Dory. Here, Jag used berce (cow parsnip) with firm, sweet Savoy cabbage. 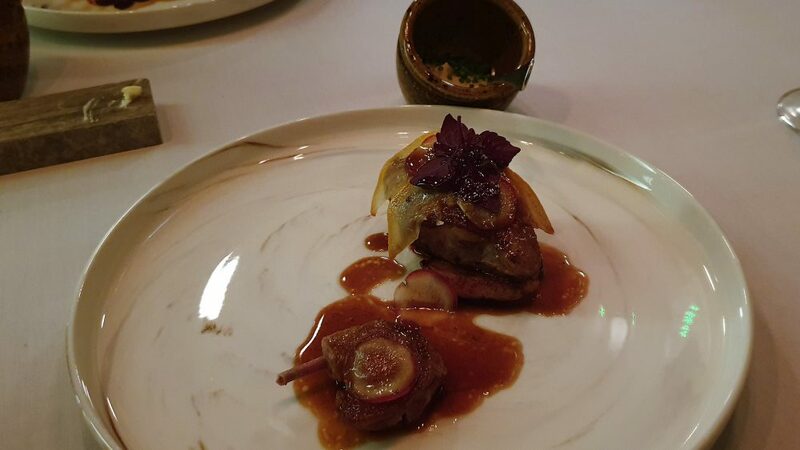 Then, the meat course – the Pigeon. Love any chance to eat pigeon. I really do like the gamey, little bird. The hero herb? The lovely, lemony melisse. What I really liked though, was the jus. It’s always the jus with these French chefs, isn’t it? All too flavourful! Dessert was a Dark Chocolate and Banana Parsley ice cream combo. Already a great way to end the meal, they made it all the more special by presenting me with an additional dessert of a chocolate cake on account of it being my birthday. 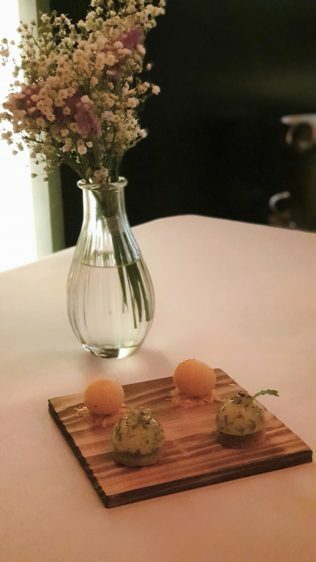 I really believe that Jag is a breath of fresh air, all wildflowery and herby, and this is one restaurant I’d be excited to return to. Just a note to those who might be wondering. The chef is Jeremy Gillon, and he previously ran the short-lived but well-loved Audace. He was amazing then, and he is amazing now. Closed on Sundays, Mondays and public holidays, except for those that fall on Fridays and Saturdays, the following Monday will be closed.